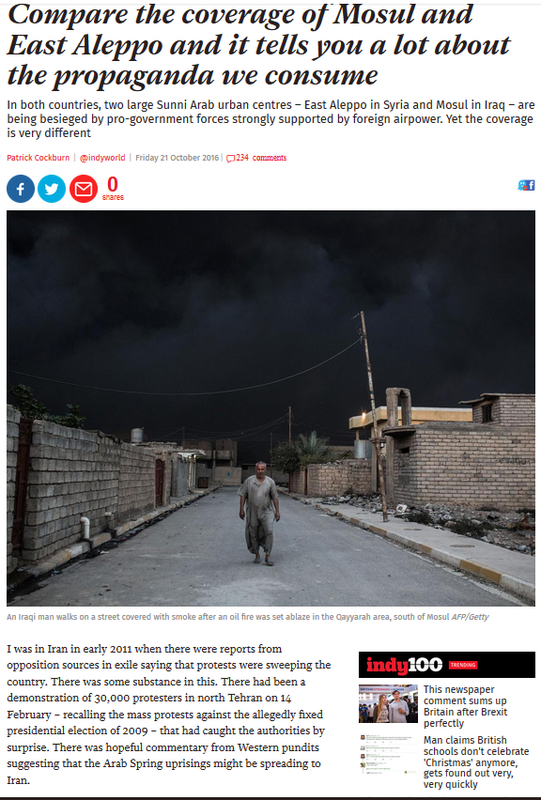 Why are Western governments angered by those who compare the military campaigns in Mosul and Aleppo? Over the last weekend of the month of November, Russian military leaders reacted to Western criticism of Russia’s support to the Syrian government to retake eastern Aleppo from armed groups. 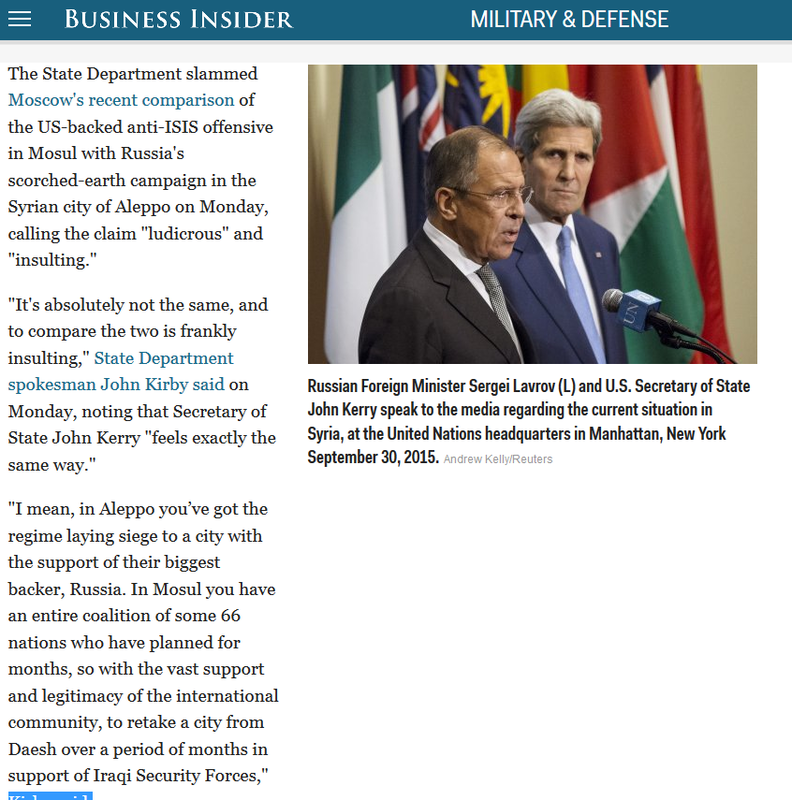 They countered by accusing the U.S. and its allies of double standard. They suggested, essentially, that what the Syrian government is doing in Aleppo is not any different from what the Iraqi government is doing in Mosul. 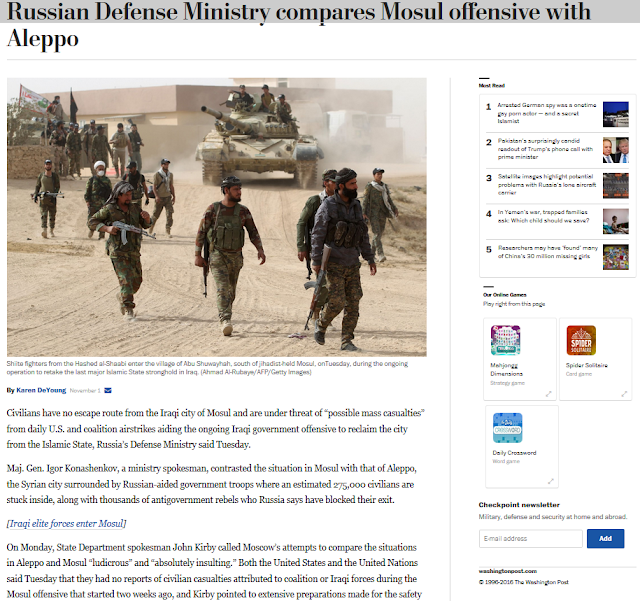 On Monday November 1, the State Department “slammed Moscow’s comparison”, calling it “ludicrous” and “insulting.” Curiously, it was actually a Western media outlet, The Independent (see below), from UK, that first made the comparison on October 21, in one of its lead stories, Compare the coverage of Mosul and East Aleppo and it tells you a lot about the propaganda we consume. Resisting the comparison is purely political as it serves no real purpose in terms of ending the tragedy the Syrian and Iraqi peoples have endured in the last five years. Those who reject the comparison are also behind the selective use of violent armed groups to achieve political goals. There is no doubt that both the Iraqi and Syrian peoples are subjected to horrific conditions, most of which are not of their own doing. Their suffering is the direct outcome of activities by regional and global powers who are using destabilizing these two countries to pursue geopolitical and economic interests. The comparison is sound, and it should unite all thse countries who claim concern for the Syrian people to focus on ending this crisis. The comparison of the situations in Mosul and Aleppo has merits. Here is why. The only difference between the Iraqi and Syrian situations is that, while there is a consensus among most world governments to support the Iraqi government retake its cities from terrorists, a handful of governments including current U.S. administration, the French government, Turkey, Saudi Arabia, and Qatar, have committed themselves to overthrowing Bashar Assad by any means necessary, including the use of al-Qaeda derivatives to achieve that main objective. It is this political goal, and nothing else, that is prolonging the carnage in Syria, which is, now, having some affect on neighboring countries. Trump said many things that offended many people. Muslim Americans were among those offended by his comments on refugees, terrorism, and Islam. Now that he is elected to be the 45th president of the United States, should Muslims freak out? To answer this question, I include this essay, which I drafted in June of this year in response to some of my colleagues’ comments. I said then that support for Trump was not a passing moment: Trump will be president. Here he is: President-Elect Trump and in about two months he will lead this country… to somewhere. I did not publish the essay then because it could have been perceived as an attempt to influence young voters, like the ones I have in my classes. Now that the elections are over, I will share it. It is still as relevant now as it was then. I should add one thought since we now know for sure that Trump is elected president: He is the legitimate president produced through the system as is. But his election and the process should not and cannot be allowed to legitimize and legitimate racism. The task of resisting falls on the shoulders of civil society institutions as understood in the broadest sense possible. A democracy is as strong as its civil society institutions. Thus far, Donald J. Trump used some of his own money to finance his presidential campaign and he thinks that his support comes from outside the political establishment. With such real or perceived autonomy, he was able to make some of the most outrageous comments that allowed him to be the lead story in every news outlet–for free. Some conservative commentators thought that his campaign will eventually collapse because Mr. Trump does not represent the Republican Party. To his credit, he is now the presumptive nominee and that did not come easy. Unlike Mrs. Clinton, for whom the field was basically cleared–a decision Democrats might regret later, she faced just two other contenders. Mr. Trump beat sixteen other candidates. He earned the Republican nomination. Still, some thought that since he is now the GOP nominee, he will stop making inappropriate and racist comments to widen his base of support. Last week, he suggested that Hispanic or Muslim judges cannot be partial because of their heritage, drawing rebuke from many Republican leaders, including the person who stands third in line to become president of the United States, Speaker Paul D. Ryan. He replied to Mr. Trump’s reported comment saying that “claiming a person can’t do their job because of their race is sort of like the textbook definition of a racist comment.” Then he added, “I believe that we have more common ground on the policy issues of the day and we have more likelihood of getting our policies enacted with him.” In other words, Republicans want to have it both ways: condemn racist comments and embrace racists. That is why many people, including myself, believe that racism in America is unique, deep, and systemic. Such racism, exceptional as it is, cannot be addressed unless the institutions that originated and have sustained racism are purged. The lack of thus understanding racism is the reason why, I think, Mr. Trump will be elected president. I resisted interjecting into a crucial political context. However, when colleagues and acquaintances who rarely talk about politics approach me these days to tell me how sorry they were to see politicians like Mr. Trump feeding the flames of prejudice against and hate of Muslims, I felt that I should say something. Then, when politically active colleagues use Mr. Trump’s example to suggest that Muslims will be safer with a Democratic president, I was even more frustrated. To use fear to create a default political position for Muslims is just as offensive, in my mind, as Mr. Trump’s comments about ethnic, racial, and religious disempowered social groups. Today, Muslims are facing systemic racism the same way all other disempowered social groups have faced it since the founding of this Republic. This is not a Republican problem. It is an American problem. It will not be the end of the world if Mr. Trump were to be elected president of the United States, and I think he will be. He may not be America’s worst president because, unlike party-favorite presidents, Mr. Trump will be heavily scrutinized by both parties and every other civil society institution in the country. A democracy is as strong as its civil society institutions. It is values and rules enshrined in the Constitution, unfulfilled many of them still, that provide comfort to citizens, not the person sitting in the White House. 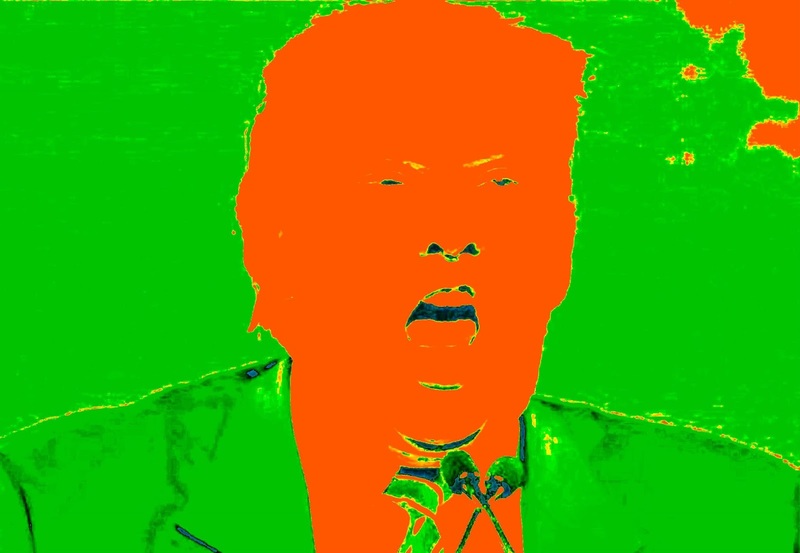 It is the distribution of political power and role of civil society institutions that curb the hunger to grab more power and use it to destroy opponents that would allow American society to weather corrupt politicians, authoritarian presidents, and zealots. The presence of dangerous men in power should empower activists and civil society leaders to collaborate more, to unite, and to take their role seriously to overcome the power and violence unleashed by the state, which is controlled by power hungry persons. President Trump will be just as capable or incapable of carrying out his personal agenda as President Obama. After all, candidate Obama promised to close Guantanamo, bring home the troops, stop bombing other countries, honor the Constitution respecting torture and extrajudicial killing, treat immigrants with dignity, insist on public option within a universal healthcare law, and rebuild the image of the country abroad. Eight years later, Guantanamo is still housing detainees. He sent more troops back to Afghanistan and Iraq. He played a role in creating two more failed and near-failed states–Libya and Syria, and he allowed corrupt rulers of so-allied nations from the Middle East to arm and supply Wahhabi genocidal fighters to overthrow the Syrian and Iraqi governments. He continued to appease and shield human rights abusers like Saudi Arabia, Jordan, and Bahrain. He carried out more drone-assisted extrajudicial killings of American citizens than his predecessors. He deported more immigrants than his last three predecessors. And standing on grounds where the U.S. government dropped its weapons of mass destruction, he refused to apologize to the Japanese victims. This catalog of shortcomings were not due to a hidden agenda or his lack of trying to do the right things. They were due to the deep state that control the long-term strategic posture of the United States, slow moving wheels of bureaucracy, and the resistance from some civil society institutions, interest groups, and political expediency. So we expect a president Trump to fail to act on some of his threats the same way president Obama failed to deliver on many of his promises. If he succeeds, it is because civil institutions leaders and citizens failed to comprehend their role and act as a counterweight to those in power. It will be an opportunity to transform society and overhaul outdated institutions like the press, which has become a tool in the hands of the powerful, not a voice for the people. Muslim Americans will not move to Canada or return to their ancestral homelands. They will stay here, at HOME, in their country where they sweat and bleed everyday, and resist bigotry, racism, and discrimination the same way millions of other Americans have done before them. * Prof. SOUAIAIA teaches at the University of Iowa. His teaching and research interests cover both classical and modern legal and political thought in Islamic societies. He is currently documenting and writing about the social movements and armed conflicts triggered by the events popularly known as the Arab Spring. Opinions are the author’s, speaking on matters of public interest; not speaking for the university or any other organization with which he is affiliated. It has been reported for sometime now that Turkish and Syrian intelligence officials have met on many occasions. Now, some sources are revealing that those meetings were not just about coordinating efforts to combat common threats to both countries, namely the Kurdish separatist, but to arrange for political leaders to meet. Turkey broke all diplomatic relations with Syria mere days after the start of the peaceful protest movement in Syria. Because of the lack of open channels of communication, the two countries relied on third parties to reach out to one another when necessary. Earlier this year, some media outlets reported that Algeria played a key role in opening a communication channel between Syria and Turkey. Now, new reports are suggesting that Russia, after the surprising meeting between Erdoğan and Putin, is working behind the scene not only to transmit information between the two countries, but also to arrange for a meeting that will bring together Assad and Erdoğan in Russia. Importantly, the meeting is significant in that it will be part of a plan that could end the civil war in Syria. Reportedly, the plan is based on some ideas from the Geneva and Vienna meetings, but more specific in terms of the fate of Assad and his role beyond the transition period. The proposed plan will call for a unity government that will include members of the “moderate” opposition groups, with Assad still in charge of key ministries during a transition period. After about 18 months, a period during which the constitution will be amended, new presidential and parliamentarian elections will be held, in which Assad may choose to run. However, should he run and win, it will be his last term. 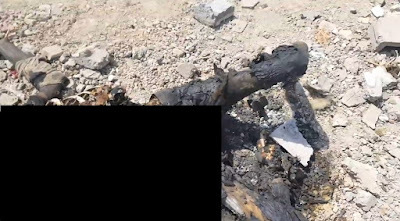 Some of the opposition fighters will be absorbed into the Syrian army and officers who deserted but did not take part in the war will be re-instated. Assad must work towards reconciliation by declaring a new amnesty for these officers who are now residing in Turkey with their families. These are extraordinary events should they actually come true. But given the steps taken by Erdoğan when he apologized for shooting down the Russian jet near the Turkish-Syrian border, it is not at all impossible to see him take steps to reconcile with the Syrian government. After all, given that his troubles with Russia were over Syria, his normalizing of relations with Putin will be meaningless without addressing the main issue that caused the crisis with Russia in the first place. It is clear by now that Turkey after the failed July 15 coup is very different from the pre-coup Turkey, albeit under the same president. 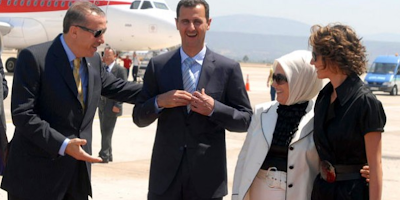 Will Erdoğan abandon Islamist armed groups now fighting in Syria? It is established that the Turkish president, Recep Tayyip Erdoğan, and the party he founded, the AKP, are primary supporters of armed groups fighting the Syrian government. The AKP-led Turkish government opened its borders for Islamist fighters from all over the world to join the war against Assad’s forces. It provided them with training, money, and weapons. The Turkish government also hosted the families of the Syrian fighters. Although its support went to all groups fighting the Syrian government because it prioritized the overthrow of Assad over all other matters, including fighting terrorism, the Turkish government offered special support to Islamists including al-Nusra Front and ISIL. It did so for sectarian and ideological reasons, but also for practical reasons: ISIL and al-Nusra were the strongest fighting groups in Syria and Assad’s government cannot be ousted without them. Five years later, and when Russia threw its military weight behind Assad, the Turkish government came to the realization that Assad is, and will remain, for the near future at least, a “key actor” who would play a role in any political solution for the Syrian crisis. That is when Erdoğan decided to adjust his strategy and work with Russia, instead of against it, to preserve some level of influence over the future of Syria. Syria is important for Turkey because of their shared problems and concerns: the status of the Kurdish people in both countries forced them to work together in the past, and will force them to work together in the future. In other words, Turkey has no choice but to remain engaged in dealing with the Syrian crisis. Adjusting the Turkish strategy will necessarily have significant effects on Turkish relations with Islamist fighters in Syria. Will Turkey abandon them? The answer can be drawn from Erdoğan’s history. He is a very skilled politician who is willing to sacrifice old alliances in favor of better ones. If his alliance with Islamists becomes a burden, Erdoğan will dump them. Consider his alliance with Fethullah Gülen for proof. Part of the credit for AKP and Erdoğan’s rise to power goes to the role played by Gülen and his movement. Yet, a decade later, when Erdoğan wanted to consolidate his power, he took steps to control that movement and its institutions. Gülen became aware of Erdoğan’s thirst for more power and he resisted him covertly at first. Erdoğan decided to bring him home where he can better control him. 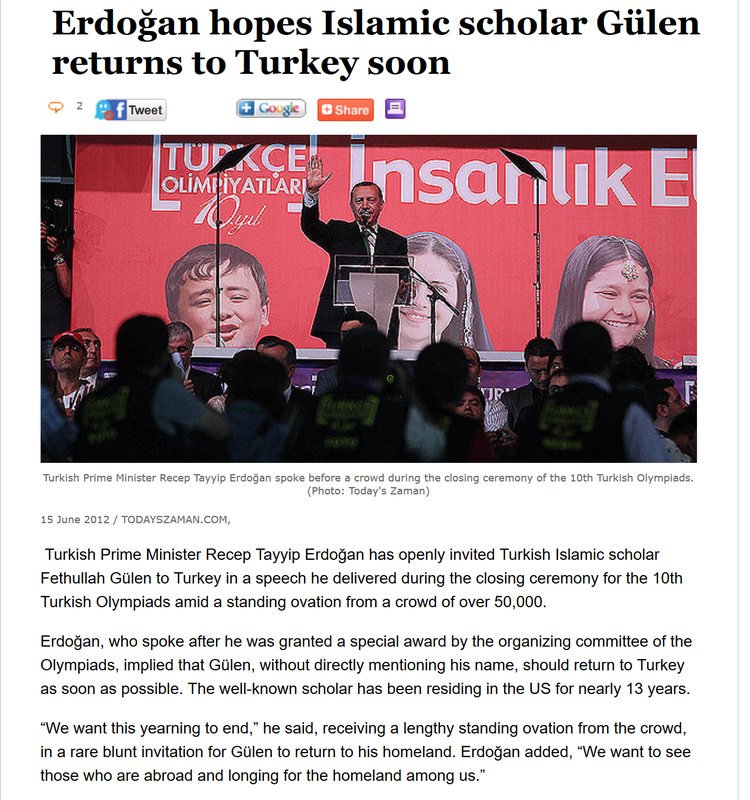 So on June 14, while speaking at a public event organized by a Gülen organization, he issued a public invitation, telling Gülen “it is time to come home.” Gülen, perhaps aware of the risks, tearfully declined the invitation on June 16, saying, in essence, not yet. Four years later, Gülen stands accused by Erdoğan of being the mastermind of the failed military coup. Had Gülen accepted the invitation then, he would be in prison now, without creating a diplomatic and legal crisis with the U.S. administration, which is refusing to extradite him at this point. Erdoğan, is the kind of politician who knows how to survive and will do whatever it takes to not just survive, but reverse losses and thrive. 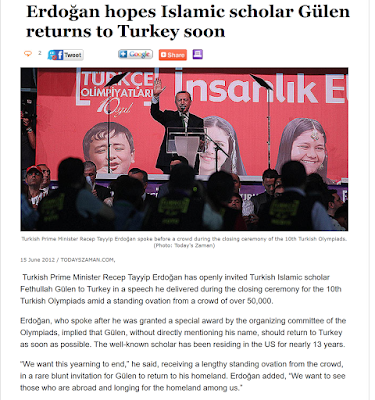 For this reason, Erdoğan is not only capable of abandoning his Islamist fighters in Syria, he could launch a military campaign to eradicate them altogether, and throw their Turkish supporters in prison. Justifying such actions will not be that difficult either. Terrorist attacks, like yesterday’s, are enough to turn the Turkish public against all Syrian opposition fighters and create a new path toward reconciliation with a Syrian government with or without Assad.